Master of writing a million titles a month, Jonathan Hickman has been crafting quite the story throughout not just the main AVENGERS title, but also NEW AVENGERS. His writing style is one that instantly draws you in, and keeps you there thanks to his attention to detail. He knows these characters very well, and that allows him to write such large teams of superheroes with ease. This issue is drawn by Lenil Francis Yu, and inked by Gerry Alanguilan and colored by Sunny Gho and Matt Milla. 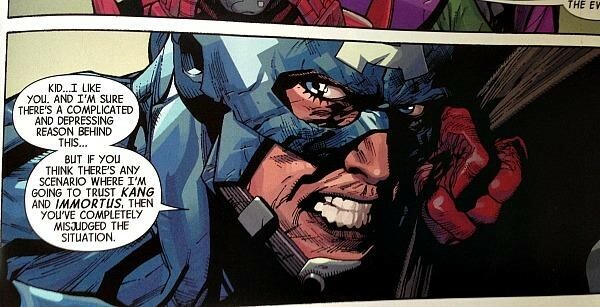 Yu has a dark, gritty style to his character work, and I personally love the way he draws Captain America. Cap is sometimes depicted as infallible, like a ‘Superman’ type of physique and face. Yu takes a different approach, and really nails the pain he endures and the weight of the world he carries on his shoulders. Throughout AVENGERS and NEW AVENGERS, it has been revealed that multiple earths across infinite parallel universes are in grave danger. An incursion event has happened, and adjacent earths are being smashed into each other, either destroying one world or obliterating both. Dire consequences, and the Avengers have obviously stepped up to try and stop it. That is no easy task, by any means. The Illuminati, consisting of Reed Richards, Tony Stark, Doctor Strange, Professor X (before he died), Beast (replacing the professor), Doctor Strange, Namor and Black Bolt put all of their resources together to figure out a way out of this cataclysm. Both Captain America and Black Panther were brought in to help as well, and it was determined to use the Infinity Gems to put an end to this madness, because comics. Captain America tried it, it kinda worked, but it destroyed the gems. Long story short, the broken time gem showed up again, hurdling the Cap and the Avengers forward through time, where they are stuck until each one has ‘fallen behind’, allowing them to snap back to the present. Everyone except for Cap. 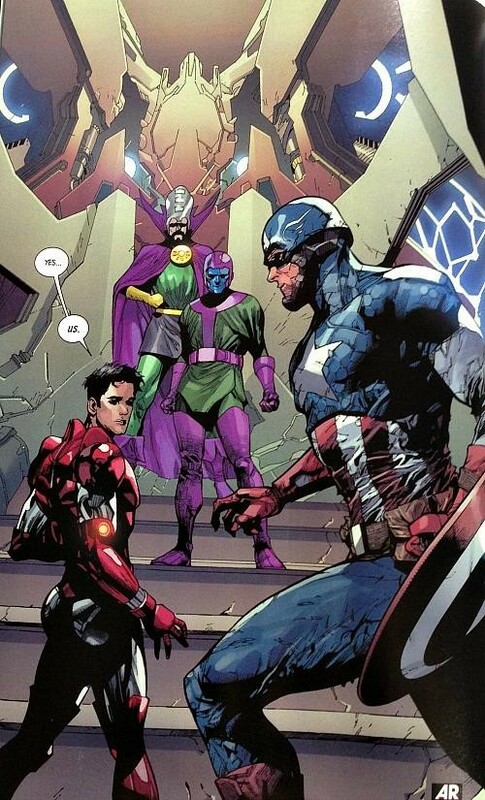 Cap has been going further and further into the future, and always seeing the same thing. A new world ravaged by time and war, and the presence of Avengers. Always, there are Avengers present, sometimes echoes of ones that Steve has served with, other times brand new beings taking on the mantles of the heroes. Just as Steve was about to snap back to the present in the last issue, he was grabbed by what looked to be Iron Man, but was revealed to be Iron Lad in this issue. They are incredibly far into the future, and he takes Steve to a citadel where the last avenger is. 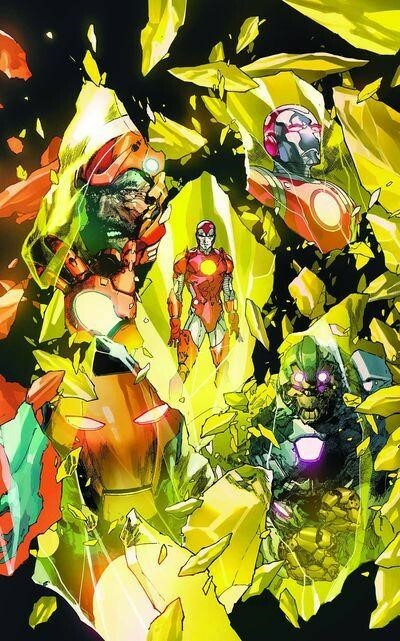 Namely Iron Lad himself, with the other versions of himself throughout time, like Immortus, and Kang the Conqueror, a frequent villain of the Avengers. In an earlier future, Cap was given advice by an older Hawkeye about the events that transpire in front of him now, and he takes action to ensure he is not at the mercy of a foe he mistrusts, even if he is also a hero (Iron Lad) that Cap has fought beside. He finally makes it back to the present with one purpose: to stop Tony and all of the Illuminati from what they are doing to stop the incursions. How many Kangs does it take to screw in a lightbulb? This issue is put together very well by the team of Hickman and Yu. each has been working for Marvel for quite sometime, and have a unique perspective on these characters. It is always a treat to see people excel at their work, especially when they are so good at it. Not much of a jab at the book itself, but this is NOT an issue to just pick up off the shelf. A ton of backstory has happened, and even though there is the obligatory recap page at the beginning, this issue is the culmination of a lot of storytelling. I have been enjoying AVENGERS as of late, as well as NEW AVENGERS and UNCANNY AVENGERS. All of these titles have been building this bigger storyline, which is leading towards the new event, AXIS. So if you haven’t been up to date on Avengers stories thus far, I definitely recommend buying some issues prior to this one as well, or at the very least getting the story synopsis from the internet. CBH Score: 4 out of 5 stars. It looks like things are just going to get worse for the Avengers, but with awesome writing and art, at least it will be a fun ride downhill.